In 1929, the Clark family opened a small mattress factory in Beloit, Wisconsin. The tiny factory was a simple, family-run operation that produced some of the first made-in-the-USA innerspring mattresses during the Great Depression and the decade following. In 1954, The Beloit Mattress Company was purchased by local businessman – and family man – Donald Poppie. With the exception of some part-time help here and there, the Poppie family operated the Midwest mattress factory and showroom almost exclusively – crafting each of their high-quality mattresses by hand. Our family still owns and operates the Beloit Mattress Company factory and showroom today. 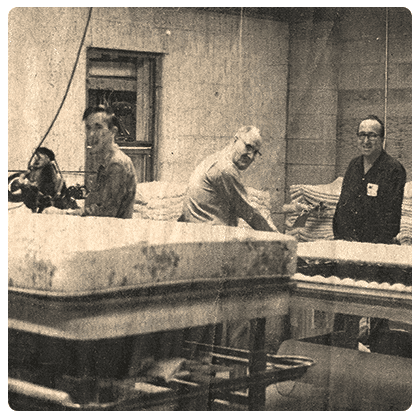 And we still make each mattress by hand, one at a time – no assembly line required. After 85 years in operation, Beloit Mattress Company is now one of the most complete, state-of-the-art mattress factories in the Midwest. Our 100% proprietary, American-made mattresses are sold directly to the public from our factory store in Beloit, WI. Though the bedding industry continues to evolve and change, one thing has remained unchanged since 1929. Every mattress at The Beloit Mattress Company is handcrafted by skilled artisans, using only the finest materials available.